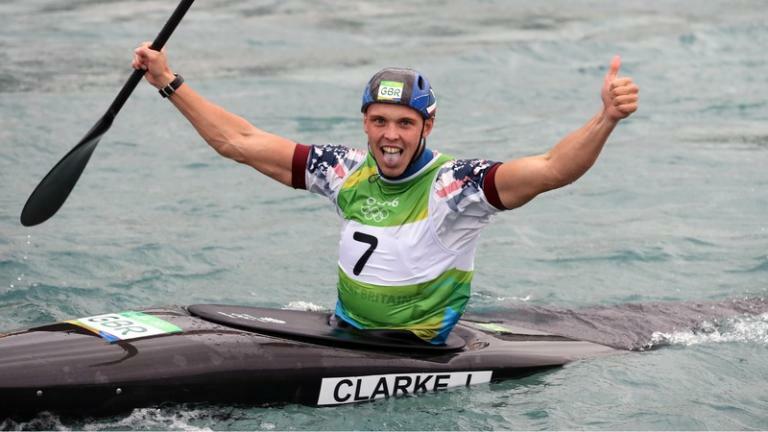 Kayaker Joe Clarke and diving duo Jack Laugher and Chris Mears won gold as Great Britain claimed six medals on day five of the Rio Olympics. Another four bronzes - in cycling, shooting, judo and gymnastics - lifted Team GB to ninth in the medals table. Laugher and Mears claimed GB's first Olympic diving title with victory in the men's synchronised 3m springboard. Clarke won kayak K1 gold, while there were bronzes for Chris Froome, Steven Scott, Sally Conway and Max Whitlock. Whitlock's medal was Britain's first in the men's all-around gymnastics competition for 108 years and took GB's haul at the 2016 Games to 12. They now have three gold, three silver and six bronze. The flurry of success puts GB three ahead of their medal tally at the end of day five in London 2012. Andrew Willis almost made it seven medals on day five when finishing fourth in the men's 200m breaststroke, won by Kazakhstan's Dmitriy Balandin. Elsewhere in the pool, Katie Ledecky won her third Rio gold when guiding the United States to victory in the women's 4x200m freestyle relay final. Michael Phelps stayed on course for a 22nd Olympic title as he beat US team-mate Ryan Lochte in the 200m individual medley semi-final, and 18-year-old Australian Kyle Chalmers won the men's 100m freestyle. The British diving pair scored a total of 454.32 to end China's hopes of a clean sweep of diving golds at the Games. It was a particularly emotional victory for Mears; the 23-year-old from Reading had life-saving surgery to remove a spleen ruptured while diving in 2009. "I still can't really believe that it's happened," said Mears. "I've come from death's door to here. I'm pretty proud."